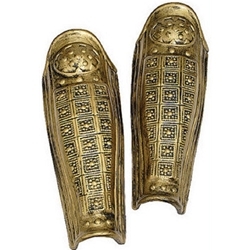 The Roman Centurion Leg Guards are available in Gold and come as a pair. Charge into fray with this fantastic armor! Leg Guards were a staple for more heavily armored Roman units. This style of armor is perfect for portraying warriors from Athens, Sparta, or fantasy characters from movies, books, and video games. See our complete collection of Armor, Shields, Weapons, and complete Soldier and Warrior Costumes to find the look that’s just right for you this Halloween or for an upcoming LARP event!